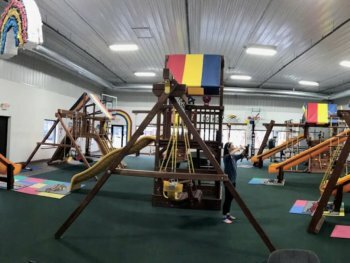 What could be more fun than a huge indoor playground filled with Rainbow Swing Sets, basketball hoops, and trampolines? Frankly, we can’t think of a thing. 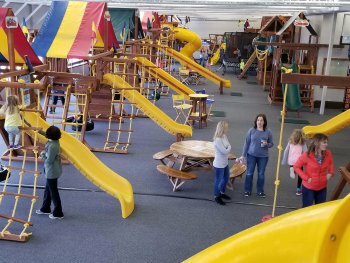 Whether it’s a rainy day, holiday break, or the kids are just plain bored, bring the whole crew down to one of our showrooms to run off that excess energy and have a giggling good time! No need to call ahead! 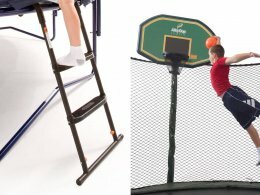 Just bring the kids in and for 2 hours, they can climb, bounce, and shoot hoops in a safe, fun-filled indoor playground. 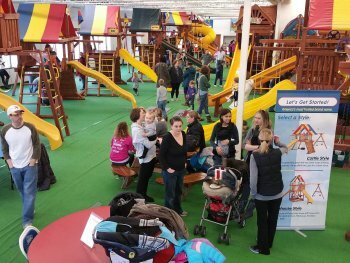 Best of all, we’re open for play year-round! Check out our three convenient locations for available days, hours, and affordable rates! 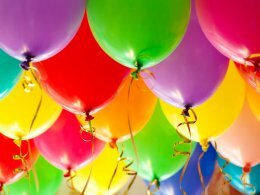 Shop while the kids bop — check out these deals! Regular price $175 and up. See store for details. $99 value. May not be combined with other offers. See store for details. (excluding 10' sizes). See store for details. Sign up and receive a 50% OFF monkey bars* when you purchase a swing set in the next 14 days.